Imagine diving into a pool of dark chocolate and emerging a whole new person from head-to-toe. 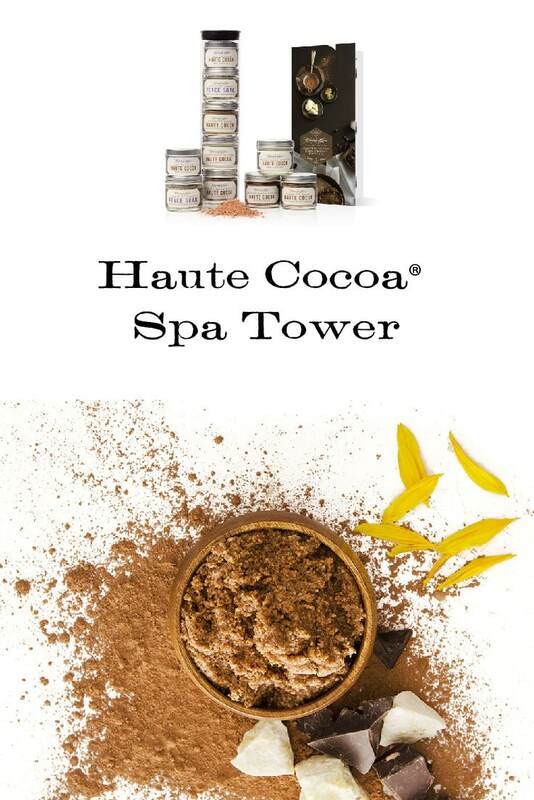 With Haute Cocoa Spa Tower, you can experience the power of antioxidants from raw ingredients found in nature. A chocoholic’s dream! Haute Cocoa Spa Tower provides a powerfully renewing ritual. Experience the renewing and invigorating power of chocolate with Waxing Kara’s Haute Cocoa Spa Tower™. 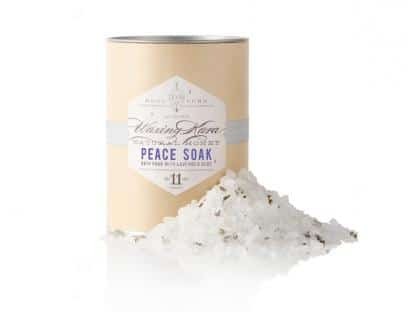 Made with carefully-selected ingredients that wouldn’t be here without honey bees. Imagine an incredibly satisfying and indulgent cocoa covered experience at home designed for all skin types. For men and women. All of Waxing Kara’s products are made in small batches in the USA. See individual label for directions and ingredients. 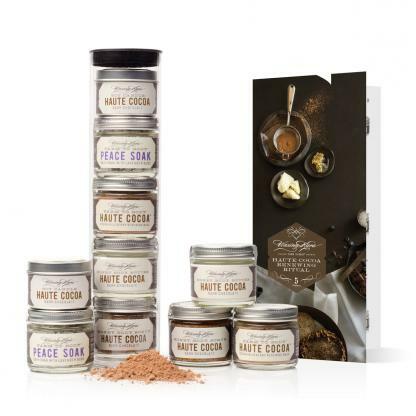 Haute Cocoa Tin Candle: light this candle to create a rich chocolatey aromatherapy experience. Haute Cocoa Butter: infused with real cocoa extracts and rich plant butters. Haute Cocoa Mask: made with real cocoa and botanicals for an antioxidant-rich skincare experience. 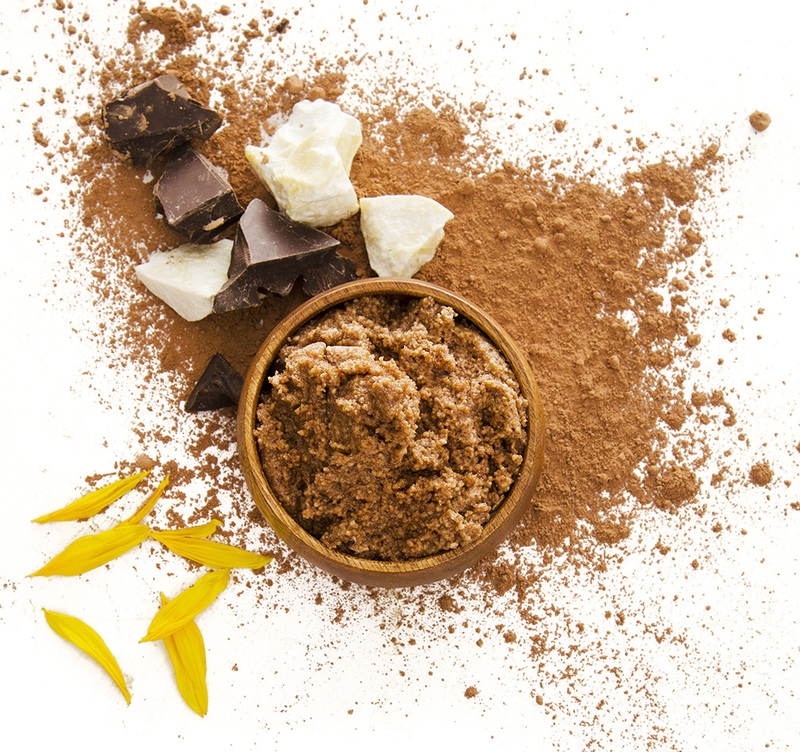 Haute Cocoa Scrub: honey crystals, cocoa powder, and plant butters gently exfoliate and moisturize the skin. Our Haute Cocoa Spa Tower treatment is designed to rejuvenate in six steps. We call this the Haute Cocoa Renewing Ritual. Step 3 – Cleanse and exfoliate with Waxing Kara Haute Cocoa™ Scrub. We’ve blended organic honey crystals with shea and cocoa butters to create a deliciously rich exfoliant system that nourishes the skin while it sloughs expired cells to reveal the fresh, healthy tissue longing for spring. Step 4 – Renew, Detoxify and Soothe with Waxing Kara Haute Cocoa Mask. We’ve created a powerhouse of skin nourishment with this innovative dry mask. Vitamin-rich dark organic raw cocoa in concert with blueberries full of antioxidants, conditioning coconut milk and mineral-rich clays work synergistically to deep clean and erase skin damage. Paint freshly blended mask onto skin and allow remaining for 10-15 minutes. Rinse with warm water or warm towels and towel dry. We recommend a petite facial or foot massage as the client relaxes and the mask works its magic. Step 5 – Massage freshly-cleansed skin with Waxing Kara Haute Cocoa Butter. Lock in all of these important nutrients and seal the skin with our proprietary blend of Waxing Kara Honey, cocoa butter, and sweet almond oil. The result is skin that’s ready to put its best foot forward! Step 6 – Relax Pour a cup of herbal tea and sweeten with our raw Eastern Shore Honey. Light a candle. Listen to inspiring music. Relax your body and mind. I fell in love with Waxing Kara products with this tower. All the products are amazing. The scrub is so moisturizing! The body butter has the best texture and feel of any body butter I have ever tried. Love the mask, and the bath salts are lovely. The scent is very chocolaty, but does not stay all that long, so I found it didn’t conflict with my normal perfume. I loved it so much I bought another to give to my daughter. Thank you Susi! 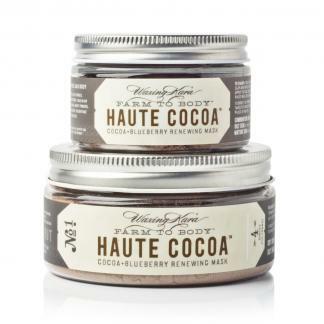 We’re so glad you are enjoying the haute cocoa products!